Along those lines, I also wonder if, when a work of art establishes a set of symbols that achieve a certain degree of coherence and resonance, that they can almost generate meaning for the observer that doesn't necessarily have to have been intended by the author(s). For me, the films of Stanley Kubrick and the plays of Shakespeare are examples of this, and also, I wonder if systems like the Tarot or the I Ching may owe their powers to establishing a set of coherent symbols that somehow generates insight into the workings of the wider world? the ideas and symbols of the Western Mystery Tradition: I'm not sure how intentional these are, or if maybe they originate more with Mark Frost than with Lynch, but I've noticed a fair amount of connections to ideas and symbols from Western esotericism, most obviously astrology, but also to alchemy, magic, etc. The strange and beautiful title sequence was what initially drew me to seek out & watch Twin Peaks. Right away it reminded me of the power of Lynch's work, which had drifted out of my awareness for over a decade or so. 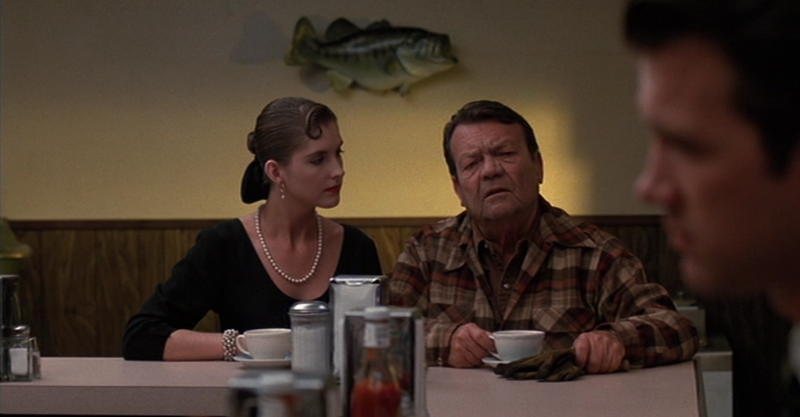 The odd, dreamlike world of Blue Velvet, and the The Straight Story's appreciation for the natural world and for small town American life, were for me both immediately brought to mind. 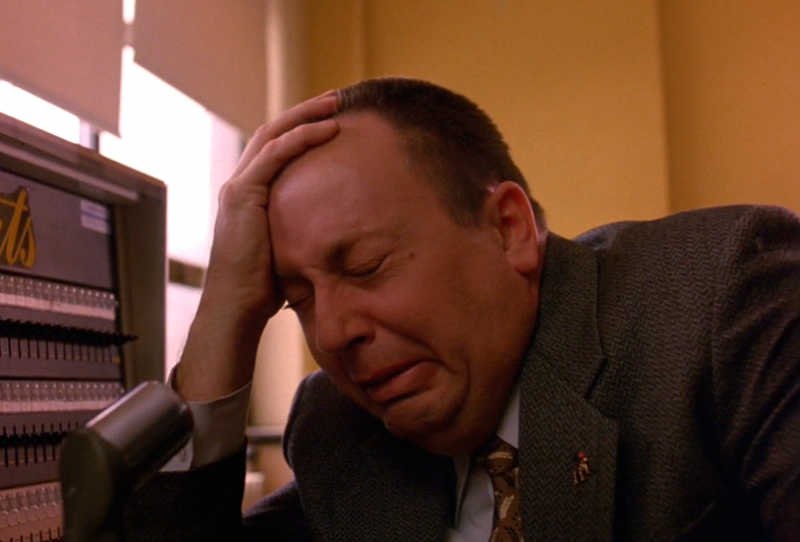 The title sequence can almost stand alone as a unique and powerful short film: Lynch's deliberate pacing and his powerful, organic imagery paired with Angelo Badalamenti's haunting synthetic music. 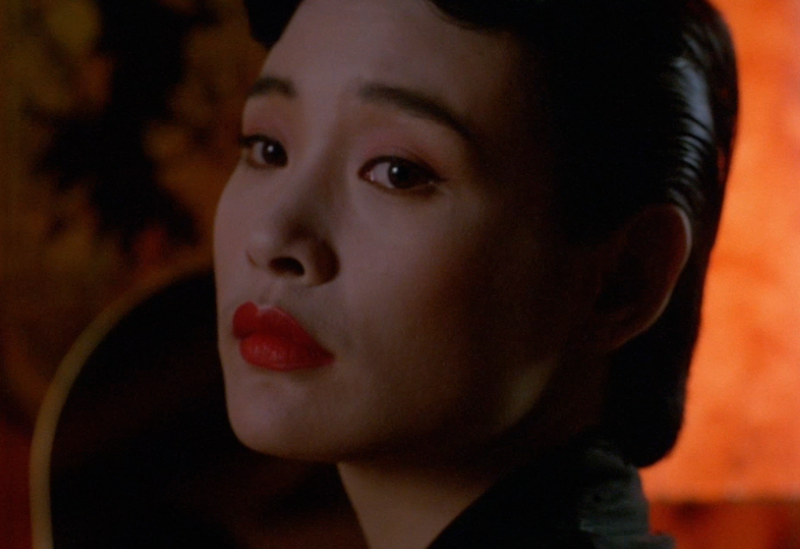 The progression of the credits seems to introduce many themes that later grow and unfold throughout the series, and like most of Lynch's work, it establishes connections to the films, music and art that came before it, and to that which followed after. 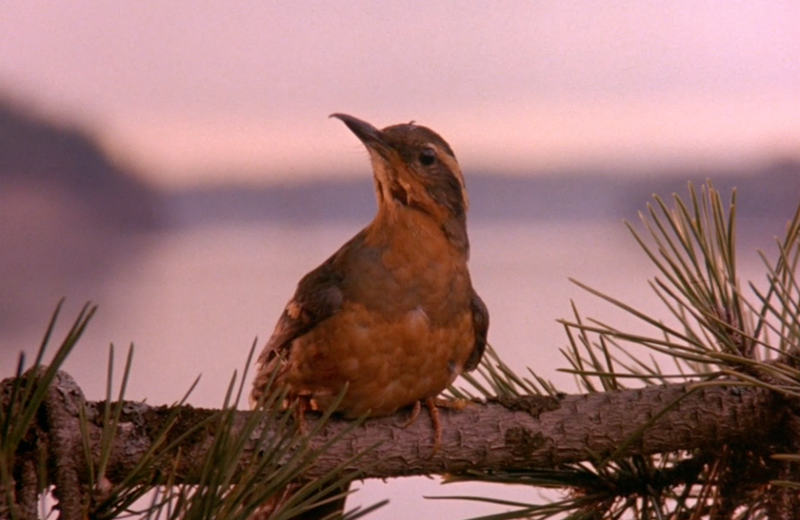 The sequence opens with a reference to Blue Velvet, an image of a robin, and it seems implied that Twin Peaks will be in some ways a continuation of that earlier film. The image reminds us of Sandy's dream regarding the Conquest of Love, and of the strange, robotic robin at that film's close, a beetle writhing in it's beak, suggesting a victory of love over a world of violence and decay. There is a goodness like those blue skies and flowers and stuff, but there is always a force, a sort of wild pain and decay, accompanying everything. 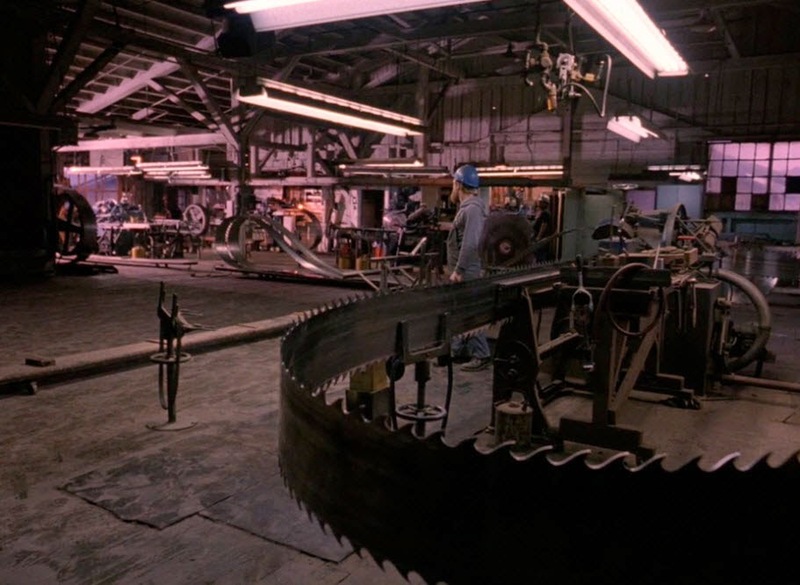 A shot of a blade being ground and sharpened again connects us back to Blue Velvet and the town of Lumberton. (Wood! Wood! Wood!) 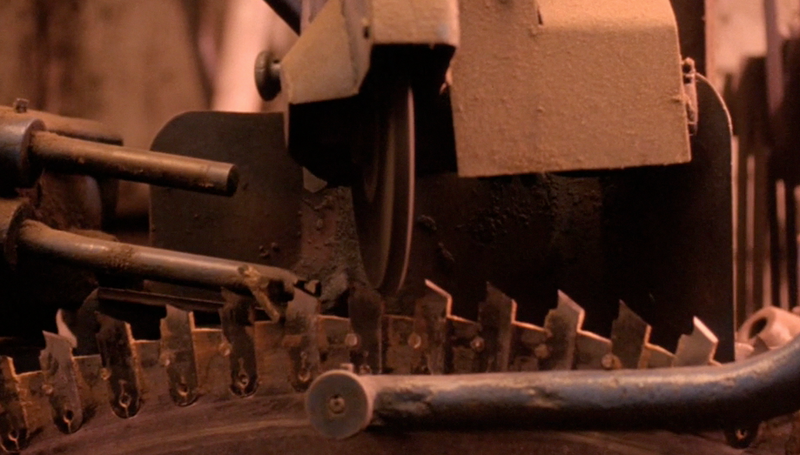 I wonder if the these grinding blades aren't also symbols of this force of "wild pain and decay", like the subterranean insects of BV: an almost inevitable process of violent decomposition standing as a counterpoint to the image of the robin. The first shots can be seen as introducing a struggle between Love and Fear, which becomes a major theme of the series. There is something oddly touching about the way the mechanical arms cooperatively guide the blades to the grinding wheels, and at the same time there something a little eerie in its mechanical autonomy. 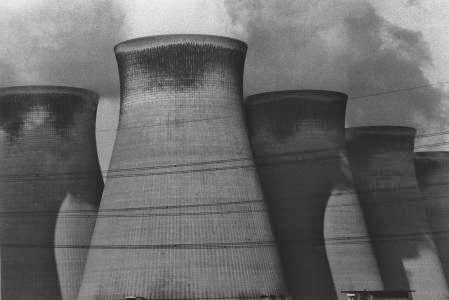 The mill shots remind me of Lynch’s industrial photography, and the industrial images in the early scenes of Eraserhead. The images of the mill suggest a conflict between the town of Twin Peaks and it’s surroundings: like Lumberton, it's a logging town, and its industry is sustained by the consumption of the very trees that seem so important & alive & significant throughout the series. The following shot is a dissolve that seems to convey this tension, fading from a grinding blade to a giant cross-section of a tree, on display. The cross-section of the tree seems like a sacrificial victim, sitting on display - on a train car no less, with tracks in the foreground, tying into a thread of symbolism connecting into the story of Laura Palmer's final days and to some of Lynch's more recent work like INLAND EMPIRE and his collaboration with Chrysta Bell, This Train, where distant train horns and the rhythmic clacking of moving train cars often form a part of the soundscape. Except the one who knows the Lord. 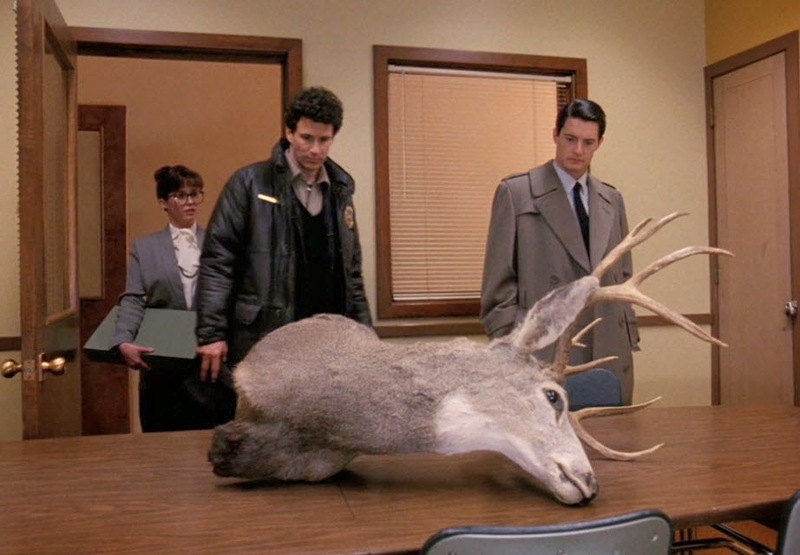 The placement of this shot seems to signify to me how Twin Peaks will be the story of a community, exploring how the death of one individual reveals all the hidden interconnections within that community, and the connections out into the natural and spiritual environments it exists within. apparently the final "1" was added, increasing the population of Twin Peaks by a factor of ten, due to network pressure to imply that Twin Peaks was not-such-a-small sized town, for fear of alienating metropolitan audiences. The figure might reflect Lynch's interest in numerology, in which numbers have symbolic qualities and significance as omens. In numerology, larger numbers are often reduced down to a basic symbol by taking the sum of the integers they contain: 5+1+2+0+1 reduces to 9, which seems to be a number of key significance in Lynch's early work, though it seems to shift to 7 in later works like Mulholland Dr. (Examples of Lynch engaging in this sort of numerological reduction, with license plates, can be found in the interviews in Chris Rodley's Lynch On Lynch.) Interesting, without Laura, the population reduces to an 8, which I believe is much less auspicious in Lynch's symbology. The credits end with images of water, flowing over the Falls at the Great Northern Hotel, then with the camera floating slowly downstream. 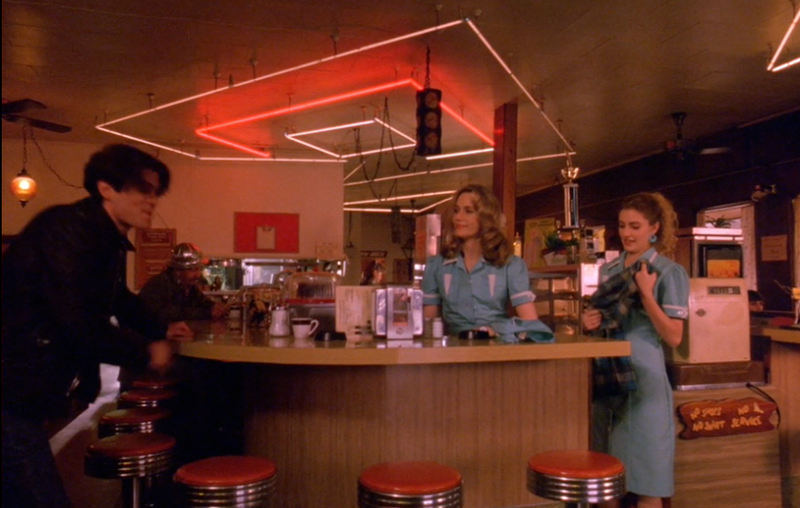 The fluid motions perhaps connect these visuals to the kinesthetic states of floating and falling referenced so often in the music of Lynch, Badalamenti and Julee Cruise that accompanies the series. I think it also subtly connects us as the audience to the image of Laura's corpse (and later, of Theresa Banks), wrapped in plastic, set adrift in the water. Lynch bathes our senses with a progression of aqueous images [...] waters flow hypnotically in a reverie of slow motion, stirring the deep currents of our subconscious. 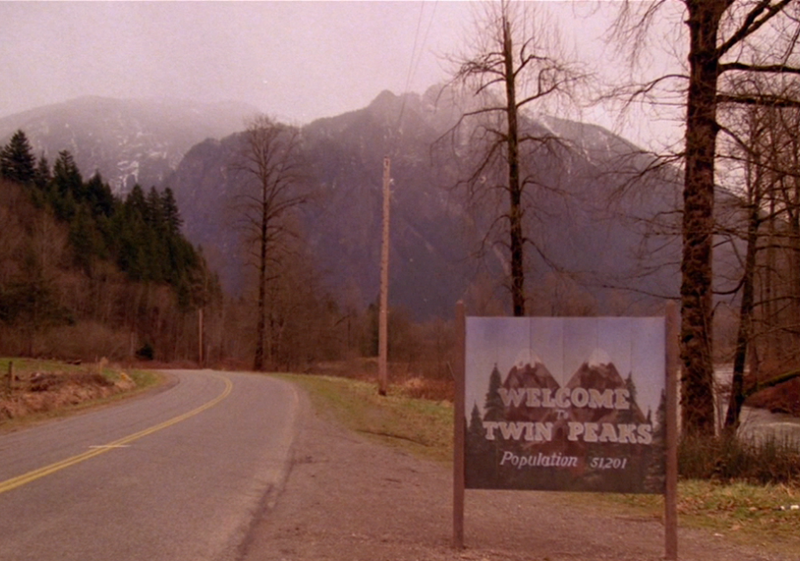 These opening moments signal that Twin Peaks will be awash in dreamy inner journeys, as well as dualities [...] two smokestacks to two showers of sparks, to two river flows joining in a singe falling cascade to two ducks on a lake shore, to two black ceramic greyhounds [...] objects and qualities that appear to be separate from each other can actually be conjoined on some hidden level; a singular-seeming phenomenon can mask and contain its opposite within. Reality is multivalent. 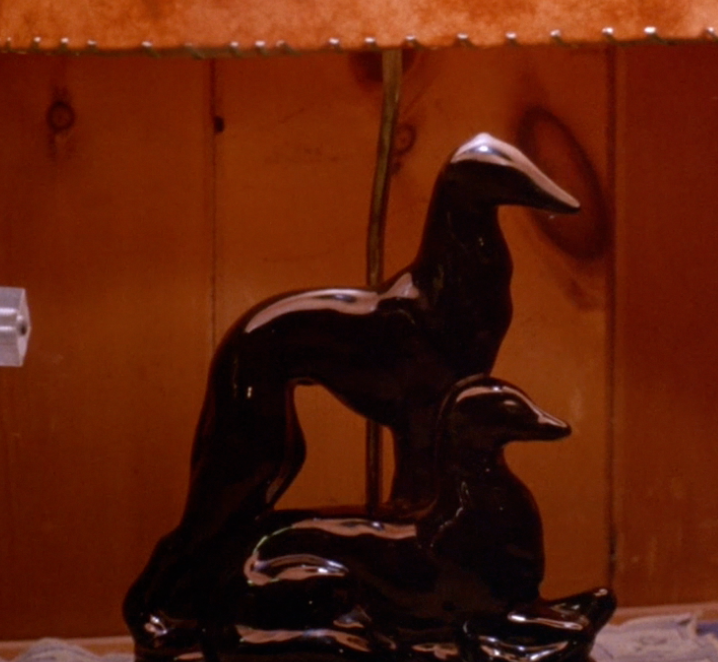 The Pilot episode moves from a pair of ducks coming ashore beside to a statuette of a pair of black dogs. 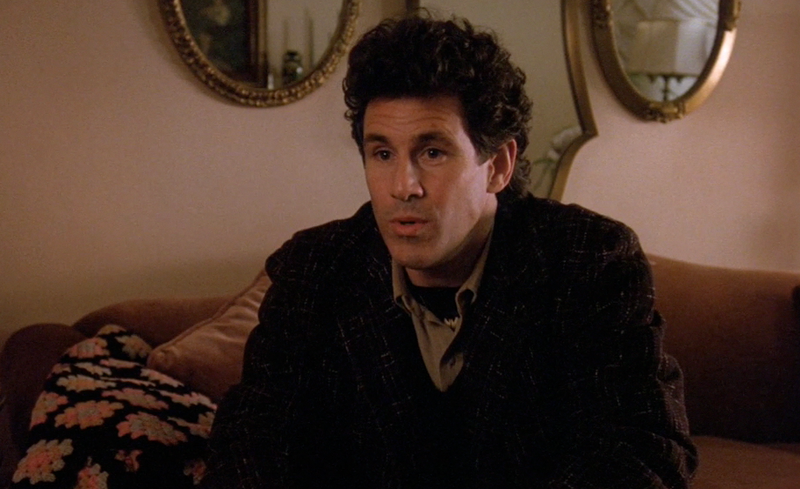 Interesting to note, the statuette seems to refer back to a similar figurine from Eraserhead, on a cornerstand between Henry and Bill in the dinner scene with Mary X's family. 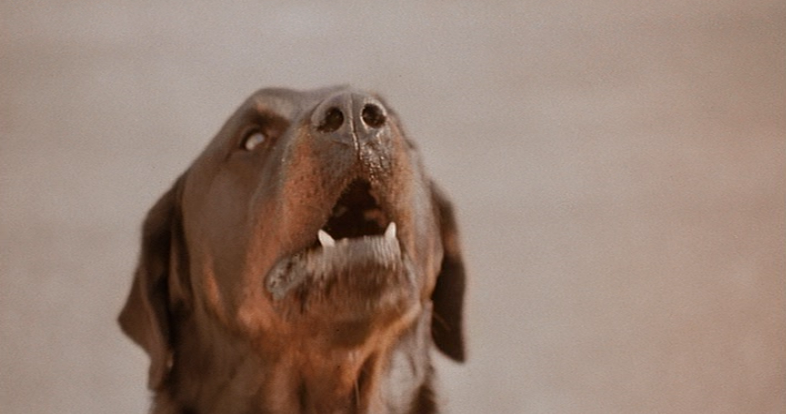 The scene at Mary's family's house also contained the strange image of the dog with suckling puppies in the living room, and ties into a longer thread of canine symbols, from the TP series and movie to the main street of Laurens, Iowa in The Straight Story. In each instance, the presence of a dog seems to herald a descent into a deeper reality, into the depths, the underworld, or the unconscious aspects of the psyche. Here, as at a few other points, I wonder if there is a reference to Greek & Roman mythology. 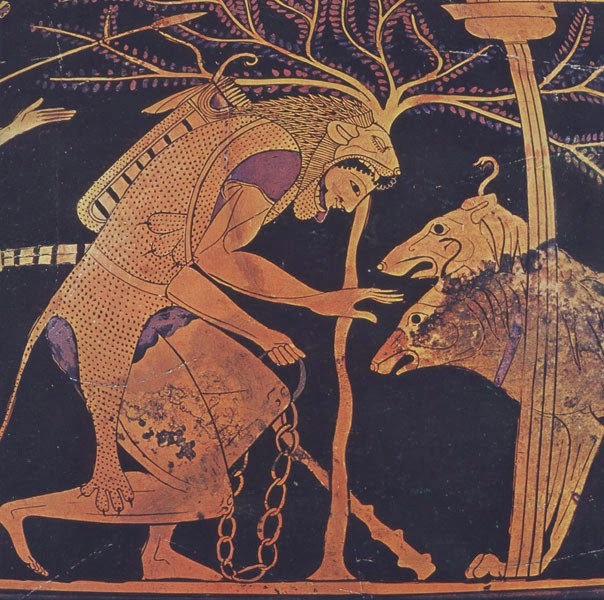 From what I understand of Lynch's creative process, it seems pretty unlikely that he would try to insert classical allusions into his work, but there are a lot of points, particularly in the etymology of names, where the reference seems like more than a coincidence; here, a connection to Cerebus, the guard-dog at the gates of Hades, seems like an obvious link. Maybe Lynch is simply drawing from an idea embedded in our culture, or maybe he & the makers of the ancient myths are drawing from a common source of inspiration? The camera slides to the left to revel a mirrored image of an Asian-American woman making herself up. (Olson in Beautiful Dark notes how bizarre and mysterious this would have likely appeared to initial viewers, set up by advertising and the title sequence to anticipate the story of a small town murder mystery). The themes expressed in this initial shot, of duality, of hidden truths, of mirrored selves and a descent into the underworld provide uncanny foreshadowing of the series’ finale, of the mirror world of Black Lodge and its collection of doppelgangers. Likewise, the look of fear and worry in Josie’s eyes right away establishes the narrative of Twin Peaks within Lynch’s concern of “A Woman In Trouble”, from Laura Palmer's story, to the line of characters from Dorothy Valens to Betty Elms/Dianne Selwyn and Nikki Grace/Sue Blue. 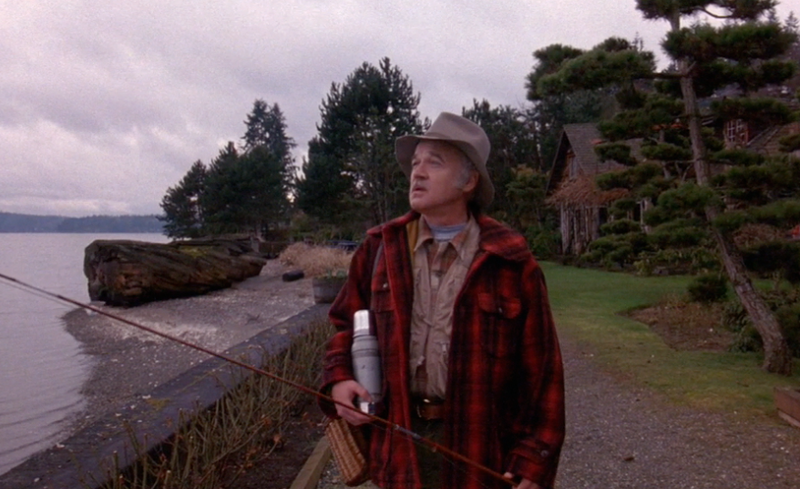 Lynch would later write, Catching the Big Fish, which uses fishing as a metaphor for the process of meditation, ideas being like fish moving around in the waters of consciousness. “A distant foghorn blows,” similar to those haunting, distant train whistles. It stopes Pete in his tracks, and causes him to turn around and discover Laura's body, which has washed up alongside a massive piece of driftwood. David Lynch, "The World Spins"
In Beautiful Dark, Olsen has an interesting theory regarding the tableau in the window at the back of the frame, that the arrangement is a subtle display of the dynamics of the Palmer family. a bird, possibly relating a bird's eye view to Sarah's tendency to experience the psychic visions. The bird is at a remove from the other figures, but looking in, maybe symbolizing that Sarah is moving towards a full consciousness of a reality she had suppressed and that was kept hidden from her. 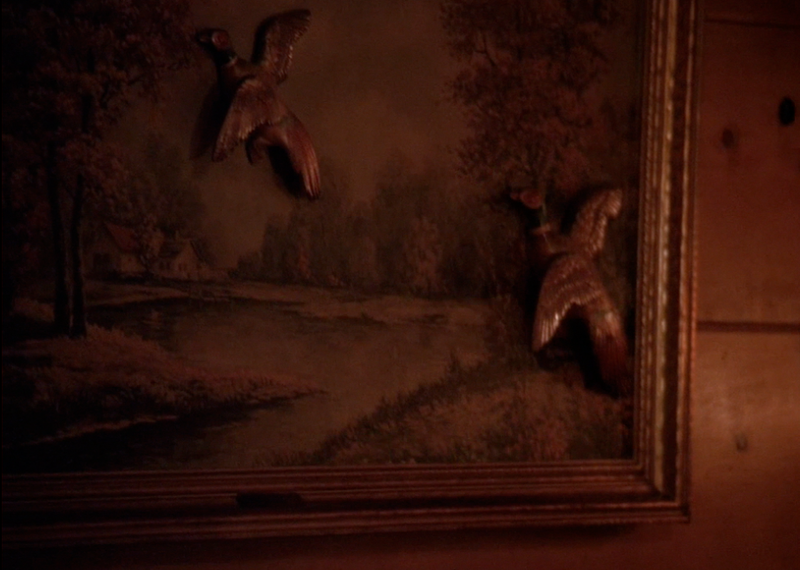 The first shot of Brigg's household also contains some possibly emblematic decorations: do the three geese represent the Briggs family? Who is the isolated rooster to the left? More interesting to me are the figures on their fridge, of a tonsured monk placed before an angelic figure. Does this represent Garland, perhaps connecting to a spirit of the White Lodge? Re-watching the series, it is interesting to see the inclusion of this hidden away angelic symbol, knowing what the final scene of Laura in FWWM will be. 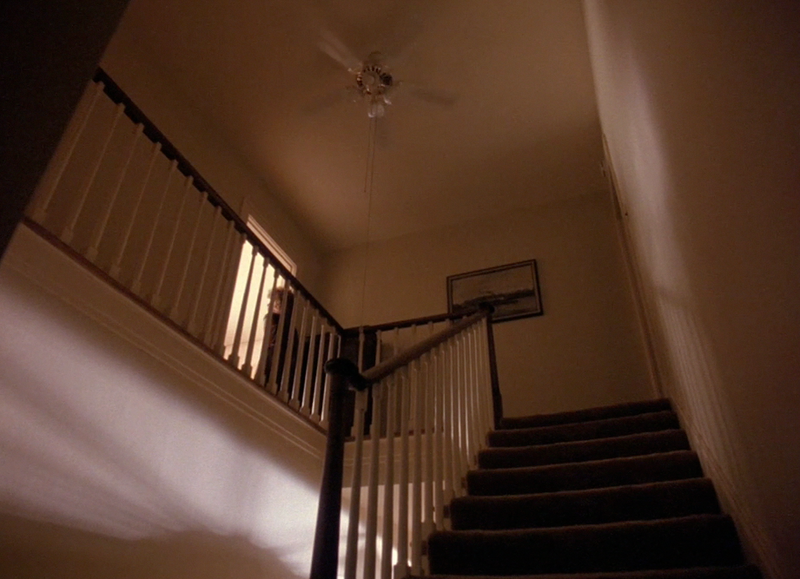 The initial shots of the Palmer household, in the moment's before Laura's death is acknowledged, establish it as a place of tension: there is something very unsettling about the upwards shot of the stairs to the second floor (a transition shot that recurs again and again throughout the series), with the spinning ceiling fan taking on a strange significance right from these early scenes. The scene ends with that horrific scream of Sarah Palmer - the scream, like her hair, seeming to radiate with tension, an expression of her frayed & worn nerves, her sheer horror and grief. Lynch, in these opening shots of the Palmer household, long before we know anything about the details of Laura's death, imbues her domestic environment with such a heaviness and sense of hidden-away dread. The house seems to have taken on the mystery of what happened to Laura, and we get glimpses of it with Maddy Ferguson's visions of the rose-coloured carpet, and in FWWM, the claustrophobic scenes of the Palmers at the dinner table. Bobby: Norma, I'll see you in my dreams. Norma: Not if I see you first. Cue the very odd Badalamenti piece on the jukebox. The dialogue and the music sort of intimates the strange, subconscious linkages between the people of Twin Peaks, connecting together in the below, in the state of dreams. The sequence at the high school, like the one that follows of Josie shutting down the sawmill, highlights again for me that Twin Peaks will be the story of an interconnected community, and of the strange sort of spiritual, psychic ties that seem to exist between them: it is as if no one needs to be told about what happened to Laura, a heavy grief just seems to descend, and people subconsciously know the horrible truth. 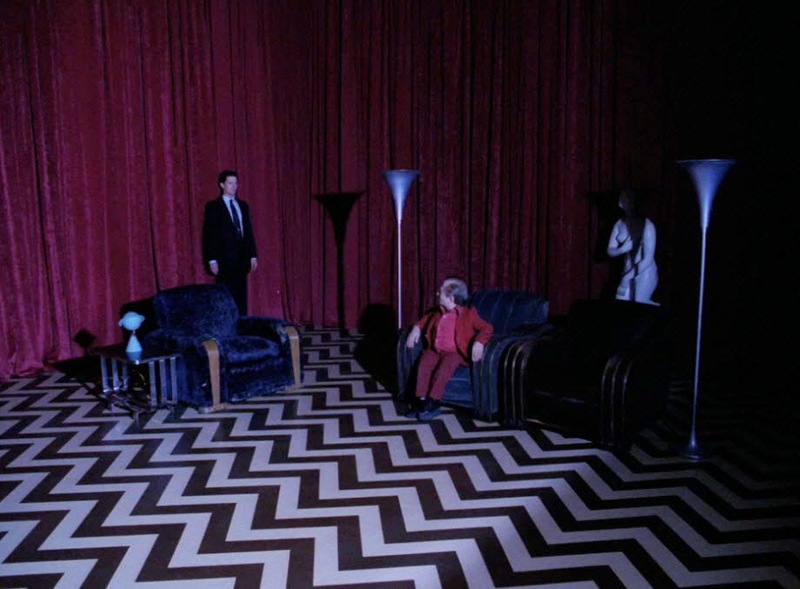 One monochromatic flat, black & white like the Black Lodge floor pattern, and a red pump, the colour of fire. I appreciate the Smokey the Bear astray in her locker, seems fitting for a mischievous daughter of a businessman & forest developer, in whose life fire will have a significant role at the end of the first season. Just below the ashtray, the word "ATOMIC" juts out. I liked the principal's address to the school. He reminds me of dynamic I often find in Lynch's films, of a person whose physical appearance almost seems like a joke on first impression, but whose actions make you take a second look at the depths of their personality. I'm reminded of Lynch's Interview Project, and online series where he features interviews with many out-of-the-way people, whose initial appearance likely seems comical, but, through their stories of their lives, remind us of their worth & interest & common humanity. David Lynch himself, with his unusual hairstyle & manner of speech is perhaps an exemplar of this dynamic: an almost comic appearance as an exterior to inner depths. I think a lot of the elderly people in this series could be viewed in this light. 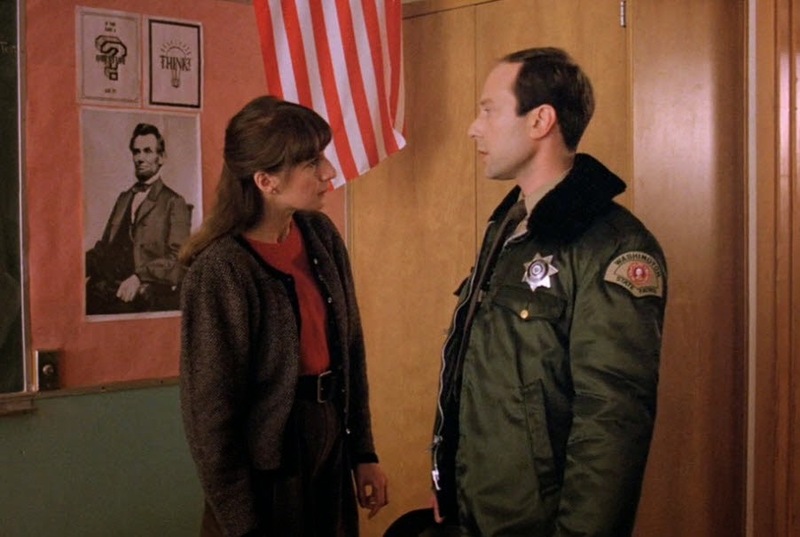 Lincoln in particular is referenced heavily in Blue Velvet: there is a Lincoln Street that seems to divide the town of Lumberton, and on which the severed ear is found. The villain of the film shares the last name of Lincoln's assassin, and he drives a Lincoln. The Civil War plays a large (and bizarre) part in Ben Horne's character arc. In Mulholland Dr., many have commented on how the Blue Haired Lady sits in a theatre balcony much like Lincoln did, and that the details of missing pearl earrings (the material of John Wilkes Booth's Derringer revovler) and the Lincoln car in which an assassination attempt on Camilla Rhodes occurs, all connect strangely to the details of Lincoln's life. Fairly early in the episode, in the scene where Sheriff Truman questions Sarah Palmer at her home, you can see a little black owl peering out a mirror in the back of the shot. 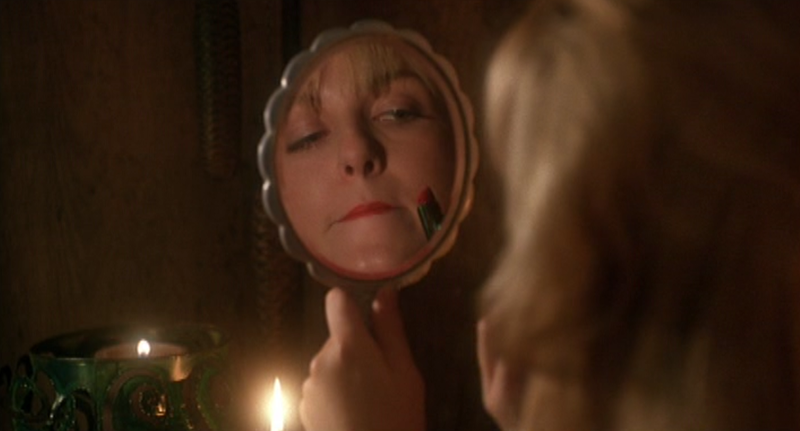 At the end of the episode, you can see BOB peering out of that same mirror, as Sarah has a terrifying vision regarding Laura's divided heart necklace. The shot of Ronette Pulaski, stunned, crossing the railway bridge before the background of snow peaked mountains, is one of the most searing, surrealistic images of Twin Peaks. The character of Ronette is given very little dialogue, remaining a largely silent figure in the few episodes that she has a role in. 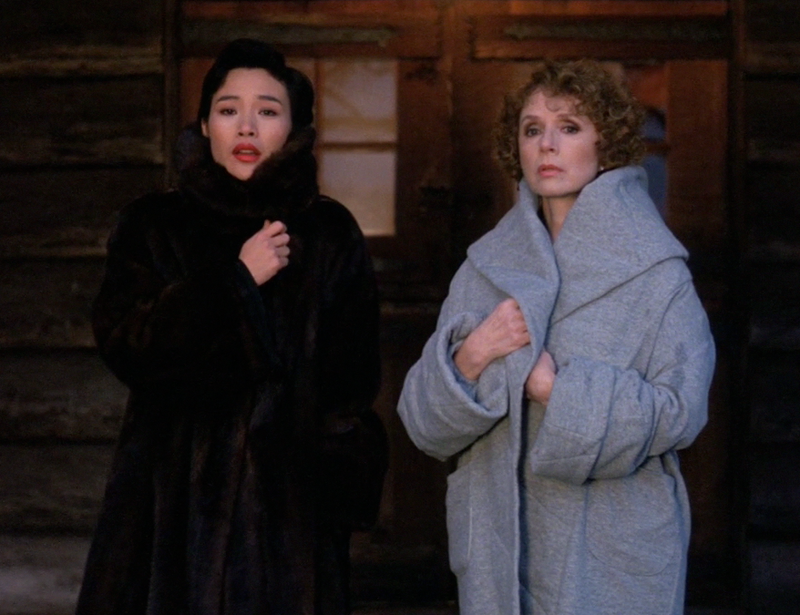 Interestingly, her appearances take place largely in the Lynch-directed episodes and in FWWM, and she basically is in the beginning, middle and end of the series, being in the Pilot, the first three episodes of the second season, the finale and the movie. 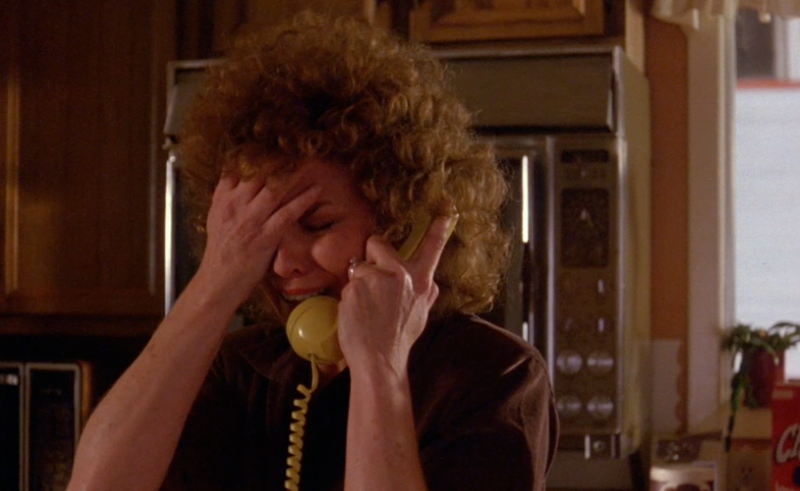 Trying to speak to Ronette is the first thing Agent Cooper does after briefing Sheriff Truman, and one of last things he does before entering the Black Lodge in the finale. We meet Ronette's father in the episode, Janek Pulaski, and one thing that struck me was the connection to INLAND EMPIRE, in which a Polish sub-plot plays a major role in film, and there is a character with the name of Janek. 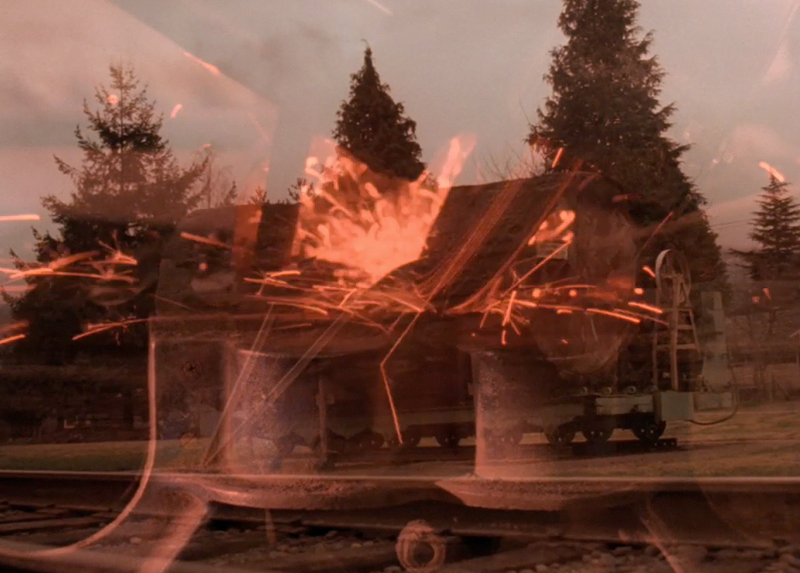 INLAND EMPIRE, particularly the Polish scenes in that film, contain the presence of a train and that distant train horn in the soundscape, and likewise Ronette seems connected to the train car symbolism, first seen walking down the train tracks and present in the train car scene at the end of FWWM. Ronette also seems to appear with Laura in the audience of Club Silencio in Mulholland Dr.
As Cooper first tries to speak with Ronette, her only lines, spoken in half-consciousness: “Don't go there, don't go there.” She seems connected to a theme running through Twin Peaks and much of Lynch's subsequent work, that of divided consciousness, of people walling-off areas of their own awareness, creating dividers around things that are too painful to acknowledge, and are therefore hidden away, almost a foreshadowing of the Leland Palmer's seperate personalities, or Laura's fractured reality, symbolized by the divided heart emblem, whose contradictions are explored in in depth in FWWM.